Gael Carter shares shamanic knowledge and ceremonies in a way that is personal, compelling, and relevant to living in today’s world. Since 1987, Gael has worked with people from many different walks of life. She helps people to awaken their own direct connection to spirit, heal their past, and dream their future awake. Gael has taught across Canada, and in America, Europe, Mexico, and Peru. As a former student has said of her: “Gael’s style of teaching is engaging; her knowledge is unparalleled”. She is adept at helping people to deeply experience the spirit of their life and to grow and evolve. 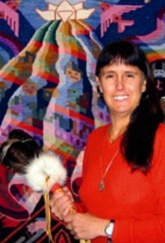 Gael has immersed herself in shamanism for more than 25 years. She has studied under teachers of the sacred spiritual pathways of the Mayan, Toltec, Yaqui, and Q’ero peoples. She stands with Hyemeyohsts Storm, on the belief that earth based knowledge belongs in the hands of the people. In service of this belief, Gael has co-authored the book, Shamanic Ceremonies for a Changing World, a resource and guide for walking a path of Spirit. Gael is also the director and co-founder of the Institute of Shamanic Medicine (ISM) which trains Shamanic Coaches in the practical use of contemporary shamanic knowledge, tools, and ceremony. If you are ready to touch Spirit more directly and are called to do some personal healing and transformational work with Gael, click here for more information. Or look under One-on-One Work at some of the individual offerings that might interest you.